With the increasing cost of business travel, your organization needs to cut travel costs and complexity while increasing compliance. The SAP® Travel On Demand solution helps you manage processes such as planning, booking, travel receipt capture, and expense reimbursement, and it lets you analyze expenses across multiple dimensions for better decision making and cost control. Your company has defined spending limits for expenses like hotel rates or taxi fares and must adhere to country-specific rules for expenses such as mileage and per Diem reimbursements. Thus, you need to track and control expenses, comply with local tax and legal requirements, and facilitate efficient approvals and audits. Built for the way business travelers work, SAP Travel On Demand helps reduce the time and cost of capturing expense receipts and submitting expense reports. By enforcing your corporate policies and legal and company specific tax regulations for travel expenses, the solution helps you adhere to corporate compliance requirements. You gain efficiency through automated, standardized processes and by incorporating travel expenses into your cash management processes. Using integrated processes to manage the entire life cycle of your trip, the SAP Travel On Demand solution lets you tie cost-control measures to travel and expenses. Each step of the travel and expense process is set up to support faster processing and reimbursements. With SAP Travel On Demand, you and your managers can use mobile devices to approve trip requests, expense reports, and exceptions and immediately update the status of trips and expenses. Increased automation means fewer manual steps, resulting in fewer errors and faster reimbursements. SAP Travel On Demand simplifies the way you enforce legal and corporate tax regulations and travel policies. You can set up your corporate booking policies and preferred suppliers through online booking partners and quickly take action when a trip is outside of policy parameters. SAP Travel On Demand lets you incorporate travel expense reimbursements into your existing accounts payable and payroll processes. In this way, you improve cash management and speed payments to employees. Analyze your travel expenses for better visibility into where your travel spending is going. Use the reports embedded within SAP Travel On Demand to monitor travel spend across business units, geographies, expense types, and travel suppliers. For further control of your travel costs, you can assign trip expenses to cost centers, orders, projects, and sales orders. 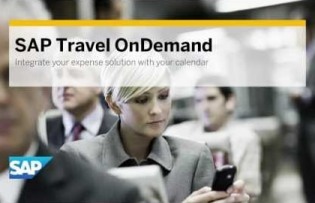 Simplifying travel planning, booking, and reimbursement processes, SAP Travel On Demand is an easy-to-use solution that encourages business travelers to adopt it. Your business users can photograph and submit receipts from their mobile devices, which boosts accuracy while accelerating expense submissions. Automated updates of travel requests and expense reports help you speed cycle times and flag exceptions.